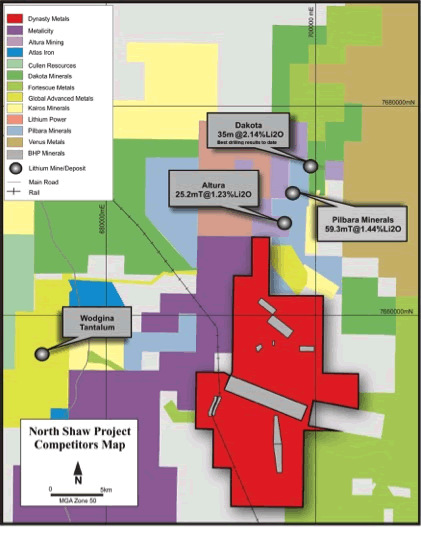 § Dynasty Resources Limited is an exploration company with a portfolio of tenements in Western Australia, currently focused on the prospectivity of its North Shaw lithium project in the Pilgangoora region of East Pilbara. The Company also holds tenements with gold and iron ore prospectivity. § As a diversification on its potential revenue sources, the Company also holds a majority stake in a Chinese financial leasing company. Dynasty’s North Shaw tenement (shown in red) with respect to the major lithium occurrences in the area.